Many Christians like to read a devotional book. Start each day with a verse or two and a “devotional” thought. These devotional books have been around more many years. Wh ile I am not discouraging the use of a devotional, I wish to point you to the best daily devotional you could ever read – the Book of Proverbs! Few of us think of Proverbs in this manner, but I maintain it might be the best way to start your day. So far the month of January, I’ll post a few verses from a chapter of Proverbs corresponding to the date of the month (31 days in January and 31 chapters in Proverbs) and give you some thoughts on those verses and how they apply to our life. Join me on this month long journey as we Walk Through Proverbs. This entry was posted in Bible Application on December 31, 2015 by The Short Bald Guy. Many Christmas songs elicit images and emotions of peace and tranquility. Some may find comfort and encouragement from classic Christmas songs and often these songs bring back cherished memories. Christmas songs serve that purpose well and I too have come to appreciate many classic Christmas carols. God Rest Ye Merry Gentleman and Silent Night are probably my most favorite Christmas songs. For example, We Three Kings is woefully unbiblical. The Magi weren’t ‘kings’ and they weren’t from the “orient.” We don’t even know if there were “three” but it’s a nice song. There is no Little Drummer Boy in the Nativity scene. This too is a cute idea, but I wonder how many people think that song is based off the bible? And speaking of Nativity scenes, the bible never mentions anything about camels and sheep being there. With shepherds present after His birth, sheep are a logical addition, but camels? Probably not. Over the past decade one relatively popular Christmas song has been Mary Did You Know? It’s a peaceful, thoughtful song posing a series of questions to Mary asking her is she knew who the Child really was that she carried, birthed and raised. This may be an interesting question for those who are unfamiliar with the actual story. From the general direction of the song, one might easily come to the conclusion that Mary had no idea of who this Child would grow up to be. The problem is, Scripture is quite clear on what she thought. She knew EXACTLY who He was. Mary seems to perfectly understand all this when she responds in verse 47 that He (her Child) would be her savior. Finally she states that all future generations would call her blessed in verse 48. In fact Mary’s discourse on who Jesus is might be one of the most beautiful and complete passages in the entire bible (Luke 1:46-55) regarding the message and mission of Jesus – the Child she was carrying. There is nothing wrong with the song and I have no direct issue with it. My problem arises from the fact that in our modern culture many Christians are so illiterate about the Bible that they don’t know that Mary knew! If you love this song, go ahead and sing it. Just don’t get your theology from this song or We Three Kings or The Little Drummer Boy. Get your theology from the Bible. Mary knew who He was. Do you? Many Christmas Blessing My Friend! This entry was posted in Bible Application on December 15, 2015 by The Short Bald Guy. Pearl Harbor. Just those words invoke images of a listing ship, a fire and an explosion. Those of us who know of Pearl Harbor only by grainy black and white images or from a history lesson often don’t appreciate the significance of that day. We “young” ones tend to think the terrorist attacks of September 11, 2001 as being the worst day in American history. More people died on 9/11 and it was on television within brief minutes of the attack. Then the second plane hitting the tower on was live broadcasts. 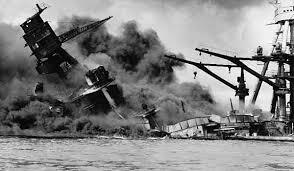 While as bad as 9/11 was, I don’t think it was anything like the Japanese attack on Pearl Harbor 70 years ago. We lost our Pacific Fleet. Other than our aircraft carriers, for all practical purposes, we lost our naval presence in the Pacific. Not only the Hawaiian Islands but the west coast of the United States was vulnerable to invasion. Rumors were running rampant about the next attack being on it’s way. No one thought we were going to be invaded in the afternoon of September 11. I’ve never been to Hawaii. But if I ever get on visit our 50th state, I am going to make a point to go to Pearl. I tend to like museums, but the Arizona Memorial is much more than just a museum. To me, this is a tangible reminder of how fragile our freedom is, of how important honor and sacrifice are and how important it is for us to appreciate our past. A World War II vet used to live right across the street from me. He was a navigator in the Pacific theatre flying in PBY flying boats. Yes, that was a real plane, which could land and take off on water. His family has told me he rarely talked about his time in the service. That was a unique generation and a unique time. This entry was posted in Bible Application on December 7, 2015 by The Short Bald Guy. Early in the opening pages of Genesis, there is the well known story of Cain and Abel. The sons of Adam and Eve had varying interests. Abel, the older son, was a keeper of sheep while his brother Cain was a “tiller of the soil.” Both tasks are necessary and important. But somewhere along the line there was a command from God about their respective sacrifices. There is room for debate on exactly what the problem was and exactly why God rejected Cain’s sacrifice and accepted Abel’s. But to me the real lesson is the reaction of Cain being confronted. It makes me wonder if there is a lesson for us about how we are to handle being confronted or corrected. Clearly, Cain didn’t handle this correctly. 1) Anger vs 5 – Quite plainly, Cain became angry. 2) Lashes out in wrong direction and killed his brother in vs 8. – Remember, Abel here is an innocent party. He hasn’t done anything warrant being murdered. Lesson: Don’t be that guy. When you are confronted or corrected, don;t tread own this road. If you find your first response is to be angry, take a moment and remember Cain and his anger. Don’t lash out at innocent people. Your sin is not their fault. Don’t lie about what you did and offer some feeble excuse about this not being your responsibility. You are your brothers keeper. Finally, humble yourself. You can not be telling people how you were wronged and that somehow you were mistreated by your correction. No one likes to be confronted and corrected. But when that happens, don’t respond like Cain. This entry was posted in Bible Application on December 4, 2015 by The Short Bald Guy. The late former-President Nixon spent his years out of office writing. I understand he wrote 10 books in his “retirement” and often was on the public speaking circuit. As the only President who resigned his office in disgrace, his return to public life was rather impressive. Richard Nixon was a very intelligent man and his understanding of foreign policy was remarkable. Few people however, realize he was a great negotiator. I recently ran across a booked called Richard Nixon’s 10 Commandments of Statecraft written by James Humes back in 1997. 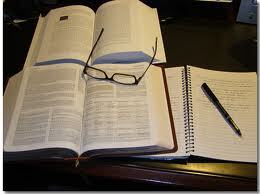 Think of how important preparation is to any task. Whether you’re buying a car or making a sales presentation, if you are prepared, you have a much better chance of being successful. It’s really a no-brainier when you think about it. Being prepared tilts the scales toward a favorable outcome. What strikes me is how poorly many of us incorporate this fundamental truth into our spiritual life. We fail to read, pray, invest in our spiritual health and then wonder why we don’t hear God or don’t see Him working on our life. We think just appearing at church a couple times a month makes us a strong believer, but we put no effort into reading and understanding His Word. Many of us complain about the evils around us and can wax eloquently about how “bad” things are now. But can you really expect anything else when few people really prepare? The temptation of this is to blame the organized church and they do bear a measure of responsibility. But to me, that is the easy way out – blame others. I wonder if the problems are a reflection of how many of us are Biblically illiterate. We don’t know His Word, we don’t pray (beyond a periodic saying of “grace” at the dinner table), we aren’t obedient to His principles and we don’t invest the time and effort into knowing Him. In other words, we aren’t prepared. I think this may be part of what Jesus was teaching in Matthew 7, verses 24 through 26. I know we traditionally teach this as Jesus pointing out that He is the rock and we need to build our foundation on Him. I totally agree with that point. But I think this goes much deeper. What does it mean to have ourselves “founded on the rock” in the context of this verse? Isn’t this verse also saying how we need to be prepared? The wind, rain and floods mentioned in these verses come to both the wise and foolish builder. What is different about the two builders? It’s their preparation isn’t it? Yet I think many play the part of the foolish builder! We say we are believers, we go to church – unless of course we need to go to something else – but we haven’t really made Him the foundation in our life. Is He foundational to your life? By foundational I mean does Christ take that number one position? How important is His Word to your life? – ya I know, ouch. The last thing I ever want to do is throw a guilt trip on people. Life is hard enough without someone scolding you for not serving God. But the fact is, for us to be prepared to face the trials of life and for us to fully walk in a disciplined life serving Him, we need to have His Word filtering our life. I need to see the world around me through the lens of His Word and I need to walk as He would have me walk. Preparation takes work. It requires us to make a decision. Am I going to make the necessary effort to prepare for life or am I just going to do enough to get along and hope I do ok. This entry was posted in Bible Application on December 3, 2015 by The Short Bald Guy. I can’t say I’m a big fan of winter. But I live in the mid-west, therefore it is a yearly battle I face. Cold and snow… and usually more snow. In fact, in my part of the world, we claim we experience all four seasons, winter, still winter, almost winter and construction. There is however a beauty about snow that is displayed when there is a significant amount of the white stuff that falls quickly. The obvious display of how mud, dirt and other various imperfections can be erased by an accumulation of snow fall. As the snow covers the world around us, it creates this unique beauty which the scriptures compare to how God deals with our sin. It is replaced by something beautiful. Of course, snow doesn’t really remove any of those imperfections and it eventually melts. But when God deals with the sin in our life (or more accurately when we submit to Him and allow Him to deal with our sin) He actually removes those sins. I love that verse and so should you. While a winter snow fall always reminds me of Isaiah 1:18 and I so glad that Psalm 103:12 gives us a great follow up to the Isaiah passage. God does clean us up and remove that sin so that it is not held against us any longer, but He has so thoroughly dealt with our sin that it is removed completely from His sight, not to be held against us again. Awesome! Maybe like me, you periodically look back on your life and wish you hadn’t made some choices that you did – committed sins that you now regret. You may even think that God holds those things against you. He isn’t. If you’ve come to Jesus, confessed your sin and understand that without Him, you aren’t good enough, God has removed your sin. Now you look like a field with a fresh layer of snow. Take a moment and enjoy God’s grace in your life. Realize He has forgiven you and He loves you. Sin no longer is held against you! I need to remember this when I’m shoveling snow. Blessings My Friend. This entry was posted in Bible Application on December 1, 2015 by The Short Bald Guy.